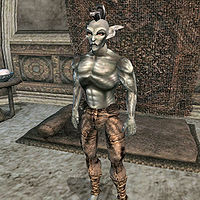 Varvur Sarethi is a Dunmer noble, and the son of Athyn Sarethi, a House Redoran councilman and Domesea Sarethi. Varvur himself is an Oathman in House Redoran. He has recently been accused of murdering Bralen Carvaren, a crime that he insists he did not commit. Still, he is currently being held in the Venim Manor. After a little investigation, it becomes clear that Varvur was not responsible for his actions. Varvur Sarethi reappears in Legends in the card Sarethi Scion. This page was last modified on 11 March 2019, at 19:11.